The use of shrubs – vinegar-based syrups infused with fruit and spices – in cocktails is a growing trend in bars in the US, as is the use of Asian drinking vinegars – which are considered to be health-giving – both as an ingredient in cocktails and as a drink in their own right. Andy Ricker’s Pok Pok, which has branches in Portland and New York, is the place to go to sample the latter while New York newcomer Willow Road uses vinegar in their take on the classic Boulevardier, one of several New York bars to throw vinegar into the mix (and into the cocktail shaker). Prime Meats in Brooklyn serves a Sidewalker, a beer-and-apple-brandy drink enhanced with apple cider vinegar. The emphasis in the US is mainly on shrubs or the more flavour-intense gastriques, rather than vinegar, but that’s changing too. Now London’s getting in on the act. We’ve yet to try Callooh Callay’s Salt’n’Vinegar Martini, but it’s high on our list. Blending vodka with dry vermouth, smoked sea salt and sherry vinegar syrup, it’s a theatrical drink, coming with a mini sea salt spray and an assortment of olives and pickles to nibble on. Given the level of invention the creative team here usually show, we suspect it’ll be pretty special. 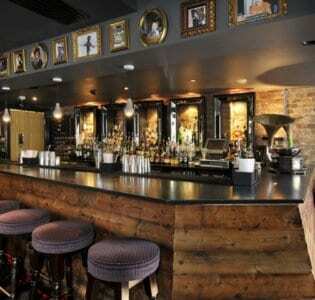 Chelsea bar Bart’s – a lively and atmospheric speakeasy style space, from Charlie Gilkes and Duncan Stirling, the team behind Bunga Bunga and Mayfair’s Mr Fogg’s, hidden away in a serviced apartment building on Sloane Avenue – has just introduced a new menu of vinegar-infused cocktails, the work of bar manager Vincenzo Sibilia. These guys aren’t using shrubs but a slug of the real thing. There are three vinegar drinks to choose from. I went for the Twelve Years, their twist on the classic Old fashioned, made with Woodford Reserve infused with cooked apple and Balsamic Vinegar, and mixed with sugar and home-made apple bitters, served short with a sugared apple garnish, while my friend opted for the elegantly presented Mon Cheri, a slightly sweeter drink blending chocolate and cherry infused apple vinegar with Grand Marnier and Pampero Añejo, presented martini-style. The vinegar gave an interesting and refreshing tang to both drinks but we found the sweet elements at times overpowering, especially in the whisky drink where the potency – the whiskiness – of the whisky didn’t come through as much as it might. The third drink, the Queen of Tarts, is a liquid version of the classic pairing of strawberries and balsamic, blending Belvedere vodka with fresh strawberries, home-made balsamic jam, lemon juice and sugar. This was our favourite of the batch, the balsamic flavour punchy but well balanced by the sweetness of the strawberries. This the one we’d order again, preferably on a warm night as there was something quite summery about the combination. The other two were definitely pleasant and interesting, though more as curiosities, and we loved our visit to the buzzing, and faintly clandestine Bart’s.